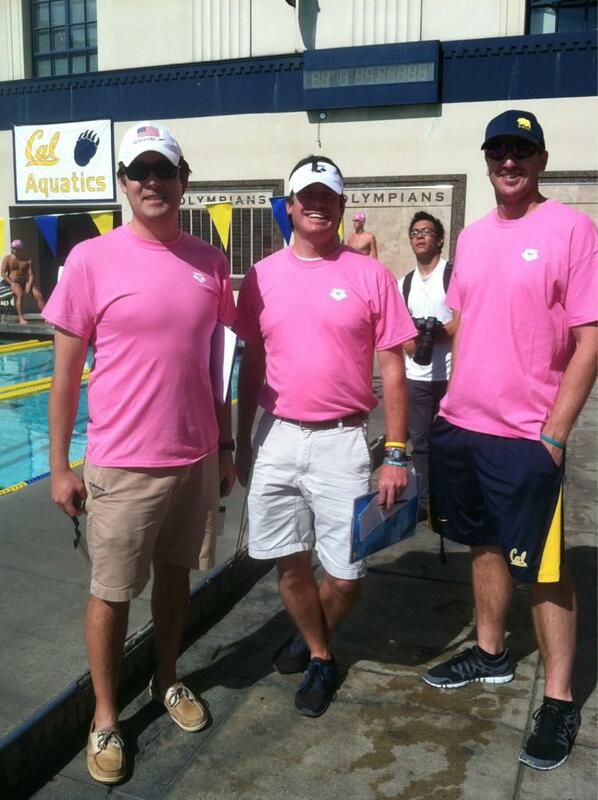 The men of Cal and their counterparts from Pacific teamed up Wednesday afternoon for their first annual “Pink-Out meet” to support breast cancer awareness. Read all about the teams’ efforts, including a $20,000 donation to the Edith Sanford Foundation. Read all about those activities here. Though there was a bigger goal for this meet, there was still some good swimming that went on at the Spieker Aquatics Center. That included a great early-season mark of 9:28.85 from sophomore Adam Hinshaw to top the 1000 free. With the team, for the most part, looking very worn down, that’s still the #5 time in the country early on this season for Hinshaw. New Cal distance coach Yuri Suguiyama only just recently got to Berkeley, and in this his first meet the Cal distance group already looks strong. Among other stars for Cal was freshman Josh Prenot. He showed off his versatility by running away with the 200 breaststroke in 2:00.08, the 400 IM in 3:56.61, finishing 2nd in the 100 back in 50.47, and putting up a 21.86 on the butterfly leg of the “B” 200 medley that out-split his A-relay counterpart. Sophomore Will Hamilton has no intention to wait until the end of the season this year to explode onto the scene. He swam a 1:48 200 fly, an even where he is the defending NCAA Champion, and also won the 500 free in a 4:36.14. In all, three freshmen earned their first victories (in a traditional meet) of their careers: Prenot, Jacob Pebley (200 back), and Nick Dillinger (50 free). The highlight of the meet for Pacific was junior Oliver Simkovic, who swam a 1:50.92 to finish 2nd in the 200 backstroke. That’s roughly two seconds faster than he started his season last year. The Cal men are back in about three weeks as they welcome in Wisconsin on November 3rd. The LSU women may have lost their star after last season, but don’t look like they’ve missed a beat headed into the new season. They got their SEC season underway with a 181-80 thumping of Vanderbilt on the road in Nashville Wednesday. Sophomore Amber Carter took a pair of individual victories. The first came in the 100 free, where she won by better than a second in 51.61, and the second, and really impressive, victory was in the 100 fly, where she swam a 55.59. There’s only a single non Cal-Bear who has been faster than that this season. She’s already looking in fantastic early form, and could develop into the new star of this team. Freshman Megan Cox also picked up a strong win for the LSU women, with a 1:52.85 in the 200 free. With a swim like that already, she’ll likely be a big part of LSU’s 800 free relay at the SEC Championships this season. The Vanderbilt women, though outgunned in this meet, do have some impressive young talent. Freshman Jennifer Mann swept the breaststroke races with a 1:03.09 in the 100 and a 2:15.03 in the 200, both of which are new Vanderbilt School Records. Chrissy Oberg took the 200 back in 2:01.95, as well. Agreed. Looking forward to it.